Since 2003, the Design Cabinet has promoted high-quality ecological, urban, architectural and landscape design in Loudoun County. Design Cabinet members include engineers, architects, planners and designers who come together in a fusion of creative community problem solving. 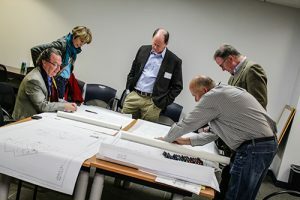 The annual Signatures of Loudoun Design Excellence Awards encourages and recognizes high quality design projects throughout the county, soliciting public nominations for outstanding design in seven categories. Selected past winners are displayed in a special exhibit at Washington Dulles International Airport. Details about past winners can be found in this booklet that was produced in honor of the 10th anniversary of the awards program. The cabinet also conducts design charrettes, complimentary brainstorming and problem solving sessions held at the request of both the public and the private sector. While there is no obligation to use the results of the design sessions, results are often used to improve plans and stimulate new ways to think about these projects.